The recommended bidder for the USMS National Publication, Douglas Murphy Communications Inc., was approved by the House of Delegates. The first issue of our new magazine will be the March/April 2005 issue. The House of Delegates acknowledged the many years of service to USMS by Sports Publications Inc. and in particular, the Editor in Chief of SWIM magazine Phil Whitten. After a year's worth of hard work by the Planning Committee and several fruitful public sessions at convention, the House of Delegates approved sweeping changes to the makeup of the USMS Board of Directors (BOD). 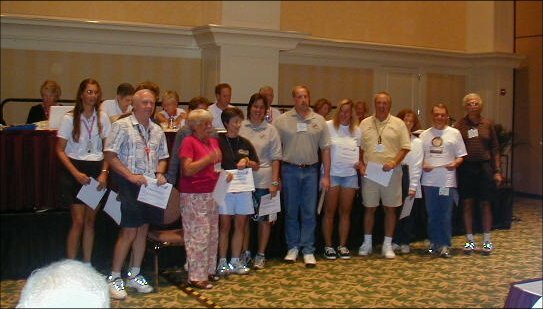 Election of the new BOD members will take place at the 2005 convention, and much more work to finalize all of the required processes will take place this coming year. June Krauser is retiring from the office of FINA Representative in 2005. An election was held in the HOD meetings, and Nancy Ridout of the Pacific LMSC will be our new FINA Representative upon June's retirement. Long Course Meters: There will be no 2006 USMS Long Course National Championships due to the 2006 FINA World Championships being held at Stanford from August 7 - 14, 2006. - Revised Election Guidelines - The Zone Committee is currently revising the EOG to streamline the process to account for the changed governance structure. These revisions need BOD approval and will be posted as soon as they're ready. Convention results are in .PDF format. In order to view them you must have the latest version of Adobe Acrobat Reader installed. Click on the link below to download a free copy.